Photo courtesy of the National Marine Fisheries Service. For the first time in nearly a century, an adult Chinook (King) salmon has been spotted in the Elwha river. Since 1913, most of the Elwha river watershed was cut off from the ocean by two dams in Olympic National Park. Last fall, Robbins and I travelled up to Olympic to witness the dams being removed. 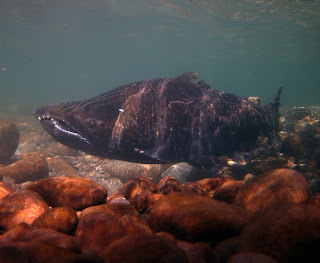 Less than five months after the dams have come down, the salmon have returned.